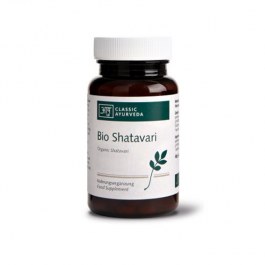 Our herbal tablets contain high quality, organic Shatavari roots dried at low temperatures (below 42 degrees Celsius). Compared to other methods of air drying, this gentle way of drying, better preserves the natural plant compounds. The roots are then ground to a powder. Pure herbal supplement with no artificial flavours or preservatives. 3 tablets daily. Do not exceed the specified recommended amount. * Bio - Certificate details - DE-eco 037 (non-EU agriculture). * Contains: 1485 mg Shatavari root powder, including 564 mg saponins. Shatavari is well tolerated in traditional use, and no significant adverse effects have been reported. Keep away from small children. Store in a cool and dry place.